Hillary Clinton speaks at Pine Middle School on Nov. 23. The candidate touched on education, equal pay and gun control. Democratic frontrunner Hillary Clinton wrapped up her second visit to Reno last night with a large organizing rally where she focused on several issues important to northern Nevada. Reno Public Radio's Julia Ritchey was there and has more. The Nevada Gay Men's Chorus sang show tunes at the outset of the rally at Pine Middle School, where Clinton spoke to about 500 people packed into the hot gymnasium. The former Secretary of State talked education, equal pay and the economy — but lingered on the issue of gun control. 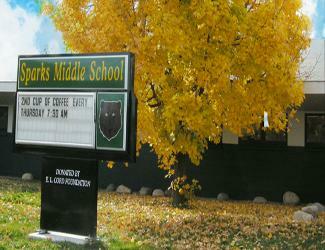 Citing the statistic that 33,000 people die each year from gun-related incidents, Clinton referenced the 2013 Sparks Middle School as a tragic, but avoidable accident. "If it hadn't been for one extraordinary teacher, there would've been a lot more death and injury." That shooting involved a seventh grader who shot and killed math teacher Michael Landsbury and injured two other students. Clinton advocated for what she called common sense measures such as universal background checks and prohibiting people on the no-fly list from purchasing guns. "We need to speak out, and particularly gun owners, of whom I know there are more than a few up here in Northern Nevada, need to join the chorus. Protect your rights, but keep guns out of the hands of the wrong people." Earlier in the day, Clinton met with Mayor Hillary Scheive and toured Crossroads, a substance abuse center run by Washoe County and the Catholic Charities of Northern Nevada. Clinton cited the public-private partnership in her speech as a good example of how to reduce America's overcrowded prisons and give a second chance to those suffering from addiction. "The first year they ran it, the county saved $4 million. Because when you add up how much cheaper it is to put somebody in this program than send them to jail, or have them send them to ER all the time, you'll save money." The crowd at the event was a mix of young and old, like Barbara Allain, a retired Washoe County school teacher, who stood in line for more than an hour. "Her programs are about children and about women and that's the most important issue that we have in our land, if we want this land to be a good land. And it always has been." The candidate did touch on education as well, touting her plan to reduce student debt and provide free tuition to those attending a four-year public university or community college. Clinton ended her speech focusing on threats abroad, promising no American troops on the ground in Syria or Iraq if she were elected president. The former secretary says she would prefer a strategy of combating Islamic extremism through airstrikes, special forces and cyber attacks. And while she did not mention chief rival Bernie Sanders, she did encourage the crowd to attend the state’s upcoming caucus in just three months. One year ago, 12-year-old Jose Reyes opened fire at Sparks Middle School, killing teacher Michael Landsberry and himself, along with injuring two students. Reno Public Radio's Michelle Bliss reports students and teachers are gathering Tuesday afternoon in the school's gymnasium to embrace, remember, and heal. Instead of holding a formal, public event to mark this tragedy, administrators are opting for a quiet, unstructured get-together after classes let out. Overwhelmingly, students and staff have voiced their desire for a typical school day. In reviewing what happened before and during the Sparks Middle School shooting in 2013, emergency management and education officials have learned a lot. That's what Democratic Assemblywoman Teresa Benitez-Thompson said during her testimony this week for a bill to update safety procedures in Nevada schools based on lessons learned at Sparks. Reno Public Radio's Michelle Bliss reports. 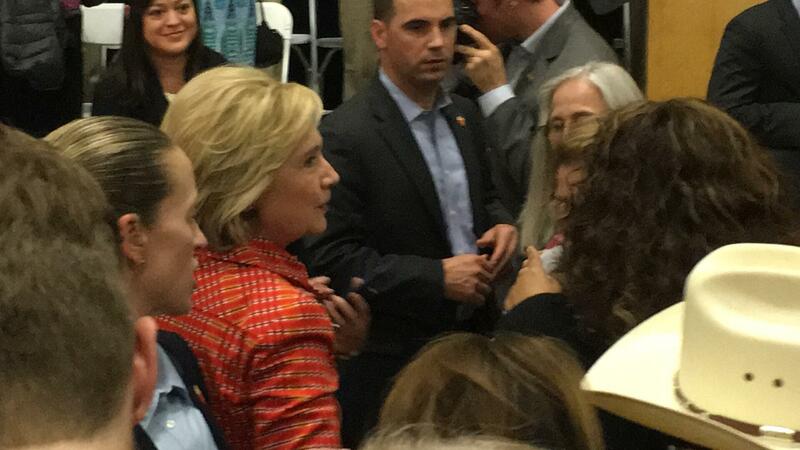 After speaking to Latino leaders in Las Vegas Thursday, Democratic Presidential Candidate Hillary Clinton stopped in Reno to talk about veterans issues. Reno Public Radio's Michelle Bliss reports. Instead of giving a formal speech, Clinton held a roundtable at a VFW in Reno with local panelists who voiced their concerns for veterans in Nevada. "I think that there are two words that should never be in the same sentence," said Democratic State Senator Pat Spearman, "and that's 'homeless veteran.'"